Mexico's most famous volcano taken from the plane from Mérida to Mexico city in April 2003. I have re-edited the original scan in order to enhance contrast and color and to better reduce the noise from the slide-scanner. Although there are still some artefacts, I think this second version is better. 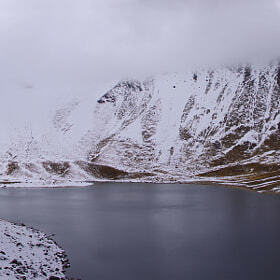 Panorama from within the crater of the volcano "Nevado de Toluca" ("Xinantécatl", Mexico) across the bigger crater lake ("Sun Lake", "Lago del Sol"). View from the volcano "Nevado de Toluca" ("Xinantécatl") towards the valley of Toluca, Mexico. 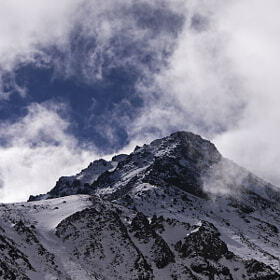 View of the northern flank of the Nevada de Toluca Volcano in Mexico in January. 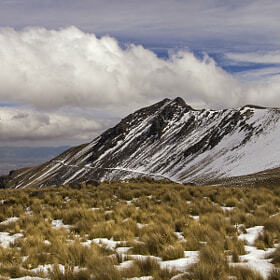 The Nevado de Toluca or Xinantécatl west of Mexico City is one of the five highest mountains in Mexico. Nevertheless, only in winter it is occasionally covered by snow. 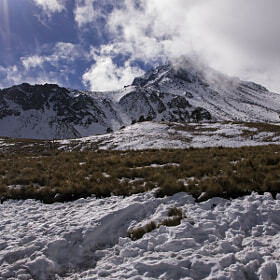 Pico del Aguila ("Eagles Peak") is the second highest peak of the "Nevado de Toluca" ("Xinantécatl") volcano in Mexico. 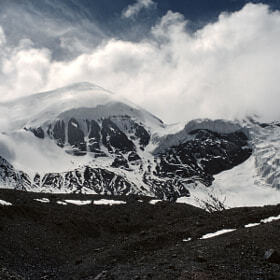 It is 4640 m. I decided not to go up there but instead to enter the caldera. 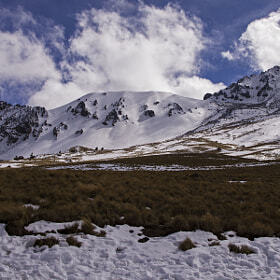 The northern peak of the volcano "Nevado de Toluca" ("Xinantécatl", México) in he morning sun. 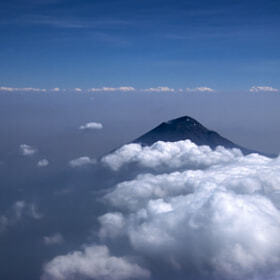 Although the volcano wears "snow" in its name it does snow only from time to time in the winter months. Of course it is then an attraction for the local population. 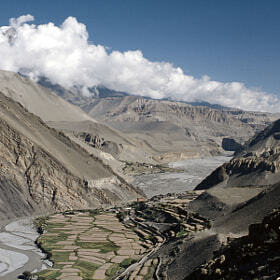 A landscape view across the Kali Gandaki valley towards the north, over Kagbeni towards Mustang. This photo tells the variety of Himalayas geologic history, from the Mesozoic sea sediments over folding and faulting, to the glacial deposits to the right and the river and terrace forming in the riverbed... - see also my story - Note: This image was scanned from a slide with Hamrick Vuescan on a Reflecta Crystalscan 7200 (Primefilm PF 7250 U). This photo was taken near the Thorung La pass above Muktinath, with 5416 m the highest point I have ever been. - see also my story - Note: This image was scanned from a slide with Hamrick Vuescan on a Reflecta Crystalscan 7200 (Primefilm PF 7250 U). 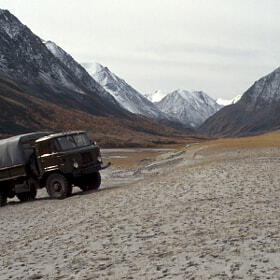 Our luggage Kamas climbing a dune of fine sand of a glacial lake in the Aktru valley, Southern Altai Mountains (Siberia, Russia). Note: This image is scanned from a slide with Hamrick Vuescan on a Reflecta Crystalscan 7200 (Primefilm PF 7250 U). 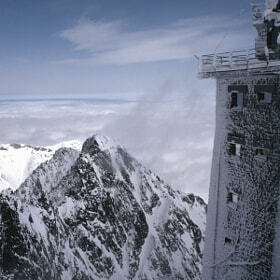 Meteorological station on top of the Lomnitz Peak in the High Tatras, Slovakia Note: This image is scanned from a slide with Hamrick Vuescan on a Reflecta Crystalscan 7200 (Primefilm PF 7250 U). 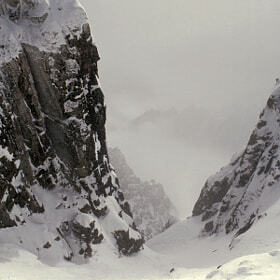 View down the hillside of the Lomnitz Peak in the High Tatras (Slovakia) with the snow covered slates and gneisses of the Tatra core within the clouds. Note: This image was scanned from a slide with Hamrick Vuescan on a Reflecta Crystalscan 7200 (Primefilm PF 7250 U). Landscape view of the eastern part of the High Tatras in Slovakia (White Tatras). 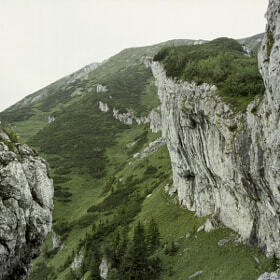 These limestone cliffs are middle Jurassic to early Cretaceous in age and form the cover of the granites that build up the central part of the High Tatras. Note: This image is scanned from a slide with Hamrick Vuescan on a Reflecta Crystalscan 7200 (Primefilm PF 7250 U). These are wave ripples which formed in very shallow water of an epicontinental sea that formed on Western Gondwanaland (today western South America) in Ordovician times, some 470 million years ago. In the foreground you see an upturned block with traces of animal that dwelled through the sea floor sediment and in the back there is the Tarija valley within the Eastern Cordillera of the Andes. And of course the workin tool as a scale... Note: This image was scanned from a slide with Hamrick Vuescan on a Reflecta Crystalscan 7200 (Primefilm PF 7250 U). 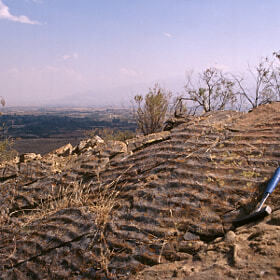 Most of the Eastern Cordillera of Southern Bolivia is build of very old (Ordovician, ca. 470 mio years) sedimentary rocks. But in Cretaceous times (100-60 mio years) this part of Western Gondwanaland was again covered by the seawater and red sandstones were deposited by streams entering this sea. 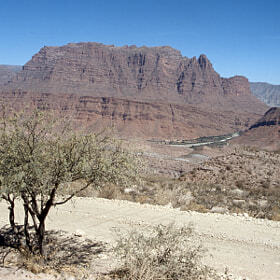 Near Camargo they form a so-called Cretaceous Syncline and rest upon the much older rocks like a "natural cathedral"... Note: This image was scanned from a slide with Hamrick Vuescan on a Reflecta Crystalscan 7200 (Primefilm PF 7250 U). 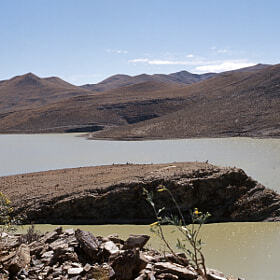 This rocky island (better peninsula) within the barrier lake of Culpina in the Central Andes of Southern Bolivia is built of early Ordovician (appr. 460 mio years) sedimentary rocks. The same rocks form these smoothly undulating rock layers in the background which give this landscape scene its special magic... Note: This image was scanned from a slide with Hamrick Vuescan on a Reflecta Crystalscan 7200 (Primefilm PF 7250 U). This is a landscape view from the Sama Pass (Cuesta de Sama) in the Eastern Cordillera of southern Bolivia towards Cieneguillas. 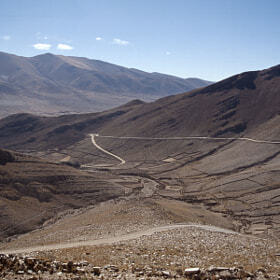 This road is the only connection between the Tarija Valley and central and northern Bolivia. 17 years ago it was still unpaved and also used by Trucks and the big Busses (The "Flotas"). The road is here crossing rock layers from the Cambrian and the early Ordovician periods (appr. 500 to 480 Ma). View is to the West. Note: This image was scanned from a slide with Hamrick Vuescan on a Reflecta Crystalscan 7200 (Primefilm PF 7250 U). 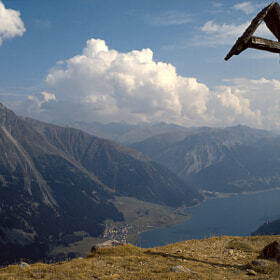 Reschenpass between Austria and Italy, view from Piz Lad towards Southern Tirol (Italy) across Graun and the Reschensee. Note: This image is scanned from a slide with Hamrick Vuescan on a Reflecta Crystalscan 7200 (Primefilm PF 7250 U). A view across the glaciers in the Oetztal Alps, seen from the Gepatsch Glacier (Austria). 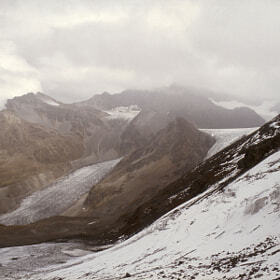 This photo is 22 years old, I don't know how far these glaciers have retreated meanwhile... Note: This image was scanned from a slide with Hamrick Vuescan on a Reflecta Crystalscan 7200 (Primefilm PF 7250 U).